Our styling formula, with Australian Jojoba seed oil, is a double whammy in a bottle. Not only does it help you get that mirror-smooth style. It helps guard your hair from the heat-styling implements you use to create it. Leaving hair soft and beautifully controlled. I am a huge fan of leave in conditioners and on the whole most have great benefits for my fine and flyaway hair. Unfortunately this spray did not quite meet the standards of others I have tried. The bottle is great with a fine mist nozzle which prevents over usage and saturation of your hair. The product has a beautiful natural sweet fragrance. When misted onto my damp hair it did have great detangling properties which for me is a must from leave in conditioners. However upon drying I was shocked that my hair was still flyaway and somewhat dry at the ends! I tried several times with this product….applying more too little effect, applying less to virtually no conditioning at all. Once dried in any method my hair had lost its shine and looked lacklustre at best. I do not feel it gave my hair any heat protection at all so I have never re-purchased. Fine spray leave in conditioner and heat protector with gorgeous natural sweet fragrance. Gorgeous floral fruity fragrance. Detangles. Fine mist spray bottle for easy dispense without wastage. Long lasting and good value for money. Not worth buying in my opinion, other brands do a much better job than this one did! My only point is it was ok it didn't seem to make it smoother or controlled as it states on the bottle, personally I wouldn't bother buying this again other brands are far better. 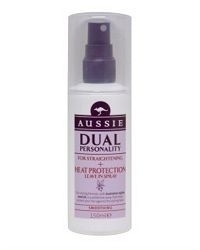 I seem to find all Aussie products leaves my hair greasy looking after a few hours. I only sprayed a little and although the scent was lovely and my hair looked good after, not long after I finished my hair looked limp and greasy. Never had greasy hair before, think the product is too heavy for fine hair. "I am a huge fan of leave in conditioners and on the whole most have great benefits for my fine and flyaway hair. Unfortunately this..."